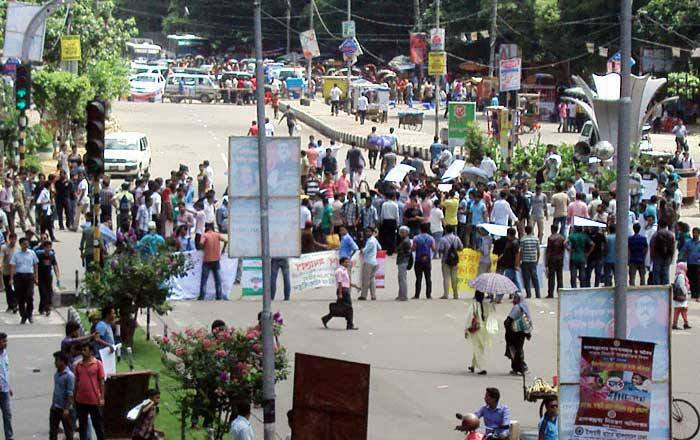 On Wednesday, the 10th of July, hundreds of Bangladesh Civil Service examinees began protests demanding an immediate cancellation of all sorts of quota in public service recruitment. Several hundred job-seekers who did not pass the 34th BCS preliminary exam had gathered in the Shahbagh crossing, blocking the roads passing through, till 10:00pm for more than 10 hours demanding the re-evaluation of answer scripts claiming that they had not been selected even after doing good in the exam and the cancellation of the quota system. Examinees of the 34th batch BCS exams continued with their protests throughout the day. The Bangladesh Public Service Commission later in the evening said that it would review the preliminary test results. The Public Service Commission on Tuesday published the preliminary results in which a total of 12,033 of 2.21 lakh candidates came out successful. The examination was held on May 24 to fill in 2,052 positions in different cadres. A commission official said that about 6,500 quota beneficiaries were selected for the written exams. The results shows that 5.43 per cent of the candidates taking the 34th BCS exams came out successful while in the 33rd BCS preliminary tests, the rate was 14.98 and in the 32nd, the rate was 44. Demonstrators contend they have failed to make the grade despite obtaining high marks because of the quota system which has allowed many with much less marks to pass the test. On previous occasions, the final results of the BCS were published based on the quota system but this time the preliminary test results were themselves announced based on quotas. Many children of freedom fighters, who enjoy a big quota, also joined the protest as they believe things have stretched a bit too far. Under the current BCS examinations system, 30 per cent of the seats are reserved for children of freedom fighters and 10 per cent for women. A further 10 per cent is reserved for districts, 5 per cent for national minorities and 1 per cent for people with disabilities. The total quota system constitutes a grand 56 percent. This means that the quota remaining for merit is just 44 percent. In numbers that would be just 902 positions in the total quota of 2052 positions. The protesters called for re-evaluation of results of the 34th BCS preliminary examination. They said that the existing quota system was ‘unconstitutional’ and all appointments should be made based on merit. They claimed that candidates under the quotas were evaluated in a manner more lenient than general candidates. Some said that they had had their answers correct for more than 80 marks but failed to qualify. In simple terms, they called for cancellation of quota system in all public examinations and called for recruitment based on individual merit. “We’re not against freedom fighters or the country’s liberation war. It is, however, crystal clear that we need meritorious people to run the country. That’s why we are only asking for cancellation of quota system in all public examinations,” protesters said. Bdnews24 says that in the afternoon on the very same day, the Public Service Commission announced its decision to review the results through a media statement. The statement, signed by Exam Controller AEM Nesar Uddin, said the commission decided to review the results in the backdrop of ‘misunderstanding among several examinees’. However, sources reiterated that the government has made no decision to reform the quota system in the public service. 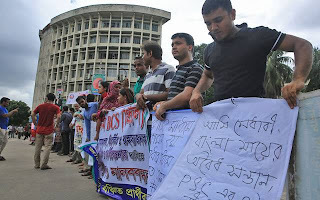 On Thursday, the 11th of July, the protests spread nationwide from Dhaka’s Shahbagh intersection when police tried to disperse a sit-in staged by the protesters at around 11:00am. The students, who gathered at Shahbagh intersection demanding cancellation of the quota system in recruitment to government jobs, were forced to leave the place as police charged baton and lobbed teargas shells on them. 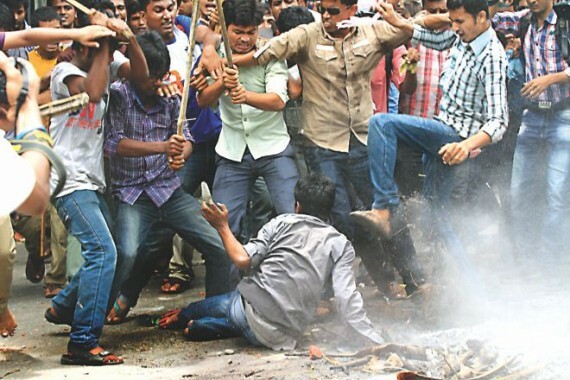 In a short time, the clashes spread throughout the Dhaka University campus area. The situation worsened when activists of Bangladesh Chatra League, the ruling party student wing, came to the aid of police. Equipped with lethal weapons, they joined police and attacked the agitating students, leaving 20 injured. 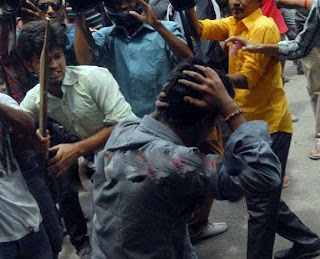 The protesting students retaliated by pelting the law enforcers with brickbats and later, retreated to the Dhaka University campus and vandalised five vehicles, including one of private TV channel ATN Bangla and two private cars, near the Teacher-Student Centre (TSC). News sources cited that police detained 12 students in this connection and reportedly took them to Shahbagh Police Station while more than 55 students were injured. Meanwhile, DU Proctor Amzad Ali flanked by BCL men went to the spot when he said the aim of the movement is not to press for demand for cancellation of the quota system but to create anarchy in the country. It is mentionable that according to a bdnews24 report this is the same Amzad Ali who had gone to Shahbagh the previous day on hearing news of the protest and expressed solidarity with the agitators. He had said: “Someone will fail after getting 80 marks and someone will pass with 50 marks – this discrimination cannot be allowed to continue.” He had said some over-enthusiastic people at PSC prepared the preliminary exam results to invite troubles for the government. The hypocrite. 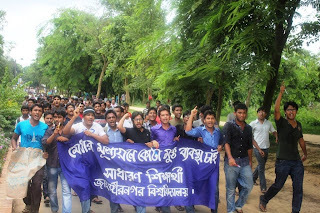 What originated in Dhaka soon spread to other parts of the country as students of Jahangirnagar University, Shahjalal University of Science & Technology, Bangladesh Agricultural University (BAU) at Mymensingh and Rajshahi University decided to express solidarity with Dhaka-based protesters. Students of public universities outside Dhaka took to the streets and formed human chains. They also chanted slogans, blocked highways and held placards and festoons to press home their demands. The students, amid all this adversity, promised that they would protest again on Friday. All major media covered the protests. On the first day, many media were seen focusing on the blockade as one staged by ‘angry’ students and protesters, opting to focus more on the sufferings caused by the protesters to the general people. The Daily Star published a full report detailing the effects the demo had on public life, with its report, “One demo brings city to a halt”. Television media also gave coverage to the protests on their news. The second day was different as media got scent of that thing they love to cover most, violence. However, one thing vividly stood out. Although the demonstrations were held at Shahbagh, media which had previously glorified Shahbagh and invested countless hours in Shahbag-related airtime were strangely terse and objective in reporting the protests. The underlying corporate and political strings attached to the freedom of coverage and expression of emotion were glaring for anyone willing to notice. As a result, few dared analyze the demands of the aggreived students and examinees. Some things are above debate. One of them is the welfare of the general populace. We need to remind ourselves that the protesters are our sons and daughters. Look beyond the surface and you shall be startled to discover that they may be the brightest minds this nation has produced. 1. A generation of freedom fighters and their direct descendants have already availed this opportunity. 2. The government has struggled over the past few years to fill up the freedom fighter’s quota due to unavailability of suitable candidates. As a result, many positions in this quota usually remain unfilled. 3. The lack of suitable candidates in the various quotas mean that many quotas are filled by relatively less eligible candidates. This may look to be a simple matter, but the fact is that a country is bound to suffer for this method of selection. 4. Bangladesh is one of the most corrupt countries of the world. I believe there is no need to give any reference on this information. Corruption gets a chance to raise its head when the competition is severe and candidates desperately seek the competitive edge. Compare the fact that only 44 percent of the examinees get through with merit and its a no-brainer as to why corruption is so rampant in getting government jobs in Bangladesh. 5. The quota ‘business’ is one of the most lucrative businesses of political stalwarts in Bangladesh. Perhaps that will give you an answer as to why the ruling party student front BCL attacked the anti-quota protesters. In short, there is no alternative to the abolishment of the quota system in order to build a deserving Bangladesh that will truly stand for Bangladeshis. Let us finish by looking at another facet of the protests, the oppression. There should have been no question of violence in the equation. But the government has acted as if the students have become enemies of the state overnight by demanding reform. A few lines of a news report affected me much. RTNN, in a report began with the observation of an unknown protester, "Gonojagoron Manch has demonstrated here at Shahbag month after month, but the law enforcers did not make any bar to their sit-in, rather, extended all sorts of support. We demonstrate over here for civic, right and just cause, but we are being responded by police shooting. What type of democracy is it?" The comment stands to explain the situation so well, that it almost hurts that everybody does not see it this way. I condemn the authorities for the highly deplorable actions they have carried out. The demands of the ‘Medhamullayon Mancha’ are demands of a generation that would like their representatives put aside their lofty ideals away for the time being and carry out action that would truly be a service to the nation. In this respect, there is no alternative to working with the aggrieved. After all, a generation is behind them in heart and spirit.